This is a great race put on by the Carolina Godiva Track Club and today was the 11th edition. 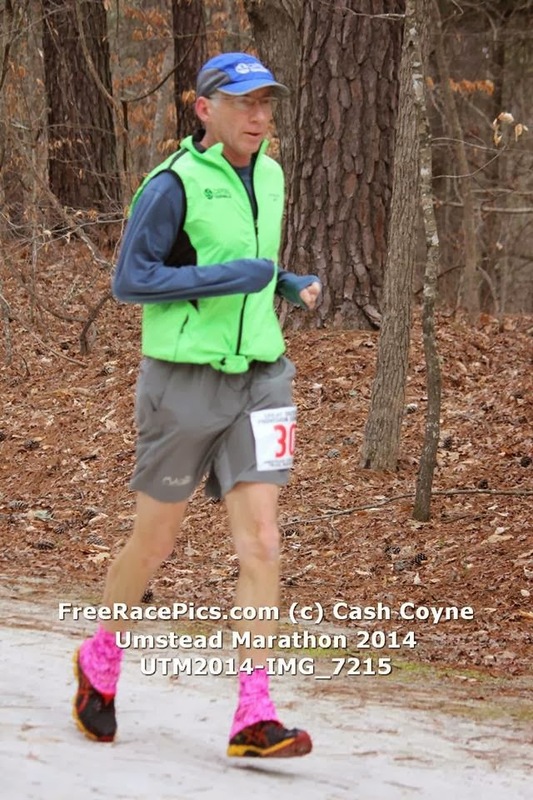 I ran the first one back in 2004 as a training run for my 1st 100 miler in Umstead and had a very enjoyable day. I returned each of the next 3 years but since that time it just hasn't seemed to fit into my schedule. 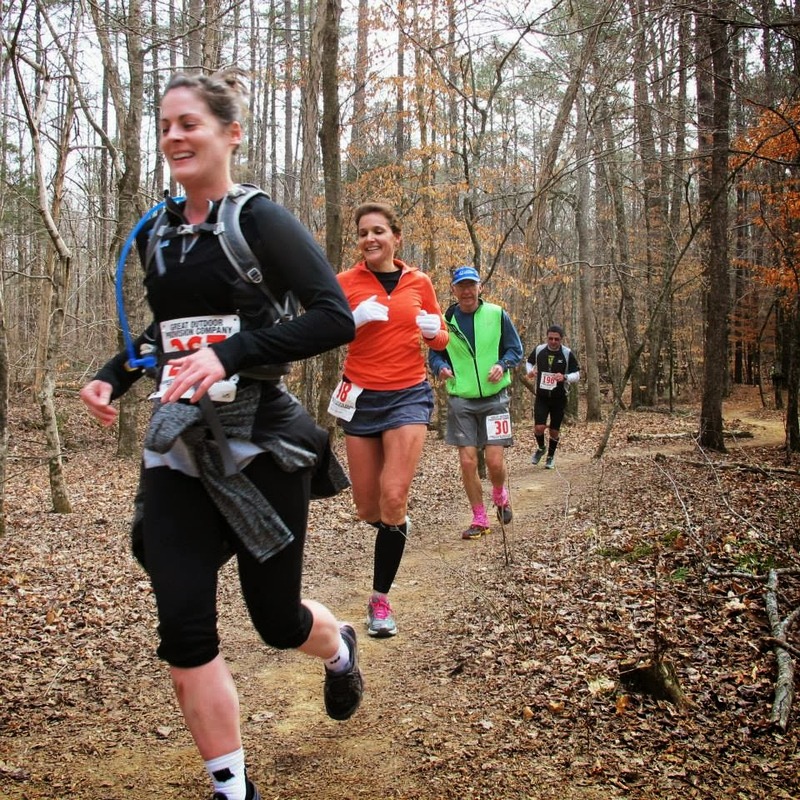 This year I am once again running the 100 and that combined with the fact that I would be able to run with a comp entry thanks to sponsor Great Outdoor Provision and the CGTC ,I was excited to have another chance to participate. 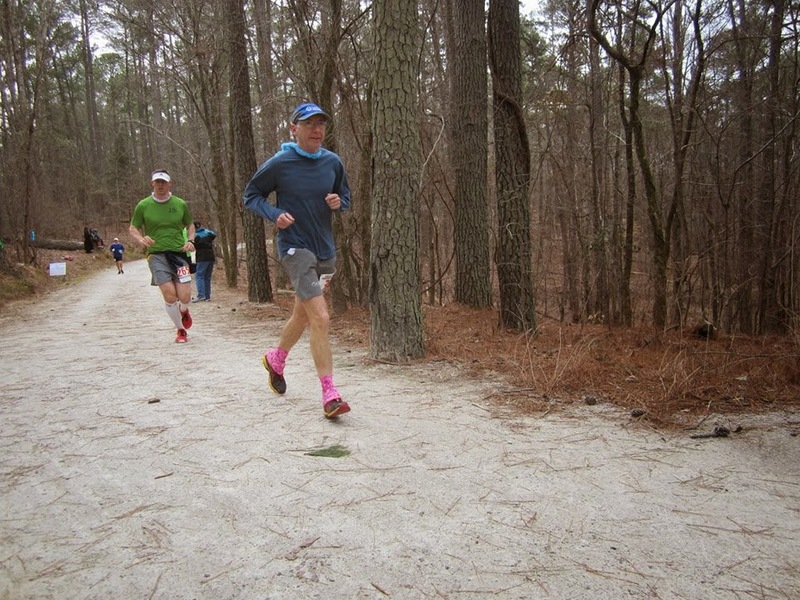 My original plan was to just use it as a training run and with it just being two weeks after a hard effort in the Myrtle Beach Marathon I wasn't expecting to run all that well anyway. Just get in the miles and have some fun. As expected there were quite a few of my friends running as well as volunteering and I was enjoying the pre-race socializing. The weather was looking great with the chance of rain now at nearly zero and the temps in a good range for running long. Just before the start I spotted one of my dear friends and Angels, Margherita Scott so we lined up together and began the race together. She has not missed a single one of these ! The pace began easy enough and we were enjoying some good conversation. The trail was a bit crowded and after a mile or see we had to work our way around some folks so we could run our normal stride. Soon we came to the first section of single track and slowed down a bit. I used to run on these trails a lot but the past two years with my focus more on road running I've spent most of my time on the green ways and bridle paths. After mile 3 I moved on ahead of Margo and was feeling pretty good so I decided that maybe I would go for a course pr. Well as close as possible. The course has changed slightly since I ran in 2007 and includes another section of single track making it a little tougher. Ok, I know I said it was a training run but it is really hard for me not to run my best unless I am pacing someone else. I just can't help it ! We came off of Company Mill trail and onto Reedy Creek before turning onto Graylin, running down the hill and then onto Sycamore Trail. By now the instincts had kicked in and it felt like home once again on the single track and I was dancing over and around the rocks and roots like I had never been away. The next aid station and the first one I stopped for some water was in the B&B lot just past 5 miles. My average pace was close to what I would needed for the record but I wasn't too concerned with just another 1.5 miles of single track to go and it was a bit flatter than the previous 2 sections had been. Soon I was back on that section of the Sycamore trail and really enjoying myself. A young lady behind me commented on my hot pink dirtygirl gaitors so I proceeded to tell her the short version of how they came to be with the Karla story which she really enjoyed hearing. She then complemented me on how well I seem to float over the single track so then I had to tell her how I ran my first time on these trails back in 1979. Soon after that the trail came back to Graylin and we would be on the B&B trails for the remainder of the race. Up and down over every hill and some of them twice. Made the turn at the "T" and then a quick mile down corkscrew before making the long 1 mile climb up to the gate. The next aid station was there and I was glad to see Pauline there to fill my refillable cup they had supplied us with while taking a gel. This was around mile 10 and I felt ok. Not great but no problems. I started of down South Turkey Creek and soon found myself alongside Jim Wei. It was nice to talk to him and the next 1.5 were the fastest of the race for both of us. Now my overall average was right about where I wanted it. I just had to maintain ! I've run this park so many thousands of miles now over the years so I knew the next 2.4 up N Turkey Creek were going to be some of the slowest so I just settled in and didn't try to push it and soon enough I was back at the B&B lot for another gel around mile 14 and still feeling pretty good. The next miles were pretty uneventful as I just tried to remain steady and only walking short periods up the steepest of the hills. I was actually a bit surprised at how well I was still running the ups. I made it back up S Turkey Creek and back into the aid station at about 19.7 miles and by now I was pretty confident that there would be no meltdown today but there were still 3 major hills to go and a few more minor ones. I enjoyed the long downhill past the lake and then prepared for corkscrew. I ran well and was happy to be passing people in these later miles rather than being passed. Now there was Cedar Ridge. I almost never go down this one and the uphill return really stinks since it is back up to the 24 mile mark. I tried to run strong down to the bottom to make up a little time because I was expecting a slow climb. By now I had the course pr in the bag so no worries there. I was actually still running up that nasty hill pretty strong too and once at the top I rewarded myself with a bit of Coke for the push up the final two miles. I continued to run strong to the finish with a nice smile, crossing the line in 4:33:57, a new race pr by nearly 5 minutes. The really cool thing about that is one, I am 7 years older and two, after just a recovery week after MB, I ran 44 miles in the 5 days leading up to this race with the workout on Friday at Marathon BQ pace ! Sweet ! All the hard work is still paying of and there will be some good performances in the months ahead.